The meeting then began with a report received from the Police on figures of crime that had been committed in the Haslington/Winterley area recently. They were reports of one burglary, one criminal damage, 1 hoax call and one assault. Our new PCSO is Lizzy Jolley and can be contacted on 0845 458 6370 ifanyone has any concerns regarding police matters. Lizzie is being given Speedwatch training, but the Speedwatch Team are very disappointed in the lack of support from the police. It was reported that there was debris in Clay Lane by Bank Farm that was a hazard to pedestrians and motorists and this needed to be cleared immediately. The street light in the Dingle between the Gutterscroft footpath and Welles Avenue had still not been replaced. This is on a very dark bend and needs to be replaced as it is causing a danger to all who use the Dingle. The Chairman thanked all who attended the annual Carol Service on the Village Green. This was a very successful community event and thanks were made to the Red Cross for the use of their hall and to the people who served the refreshments also. The collection made at the Carol Service towards a motorised scooter for a young disabled boy raised approximately £119.00. Thanks to all who contributed to this worthwhile cause. The matters of the changes and closures to Crewe Green Roundabout can be accessed via the website of Cheshire East Council. Also, the matters of Sydney Road bridge and the closures of this road can be accessed via the Cheshire East website. 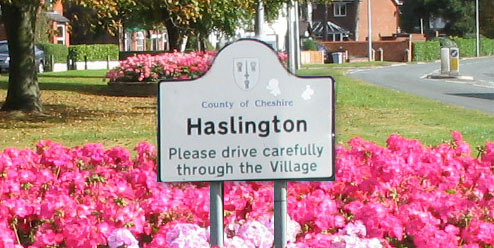 They can also be seen on haslington.org and the Haslington Parish Facebook page. Coucillor David Marren told the meeting that Cheshire East are trying to start a Neighbourhood volunteer group to help people who were living alone. There was to be a Holocaust Memorial Service on 26 January at Sandbach Town Hall and Councillor Mrs Farrall was to represent Haslington Parish Council at this very worthwhile event. Please can the issue of dog fouling and litter in general be raise at the next meeting?